Bites of potato waffle, pommes soufflees, lobster paloise and millefeuille. Super high end finger food. 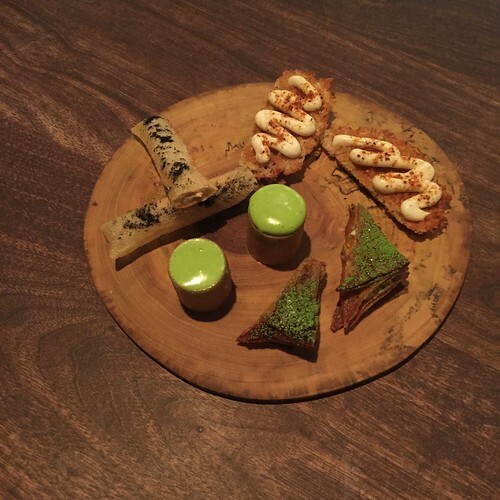 The lobster paloise, which I’ve had multiple times now, is my favorite of any of their amuse-bouches offered so far. 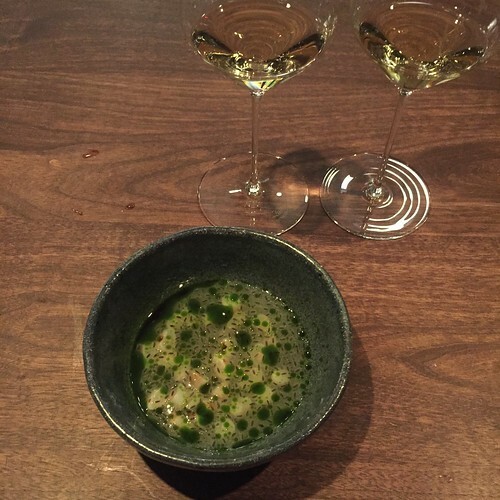 Madai – consomme, shiso and finger lime…a relatively newer dish that’s now one of my favorites for its pure flavors. Lately, they’ve been serving it with sea bass instead of madai, which is a bit firmer and stands up really well. 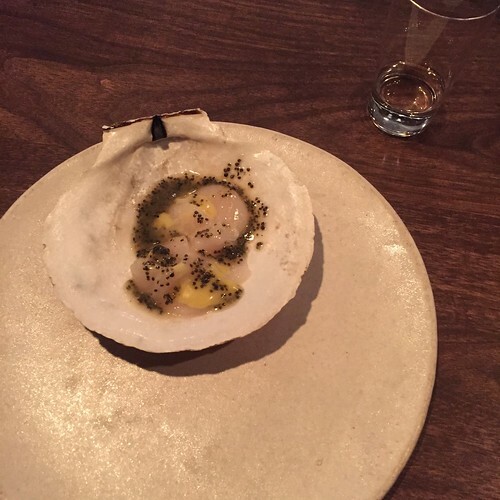 Raw scallop with tonburi (a Japanese herb known as “caviar of the fields”) and citron. Here, paired with Kaika “Tobindori Shizuku Daiginjo” from Togichi, Japan. 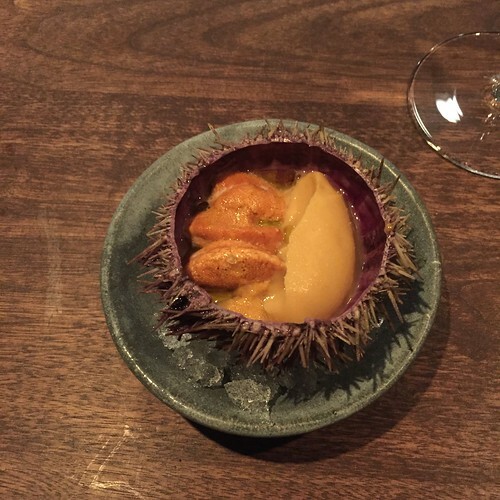 An old favorite and Ko staple: uni with chickpea and hozon. I love everything about this dish – the colors, the slightly different textures and the olive oil and sea salt that make everything pop. 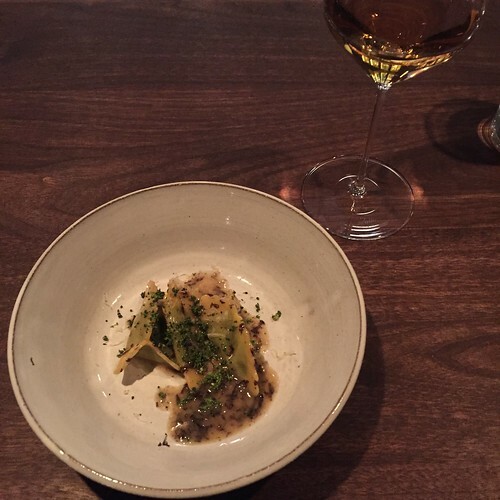 Razor clams with apple and basil seeds, paired with two 2014 wines from Peter Lauer. Stunning. Oh my god…this. 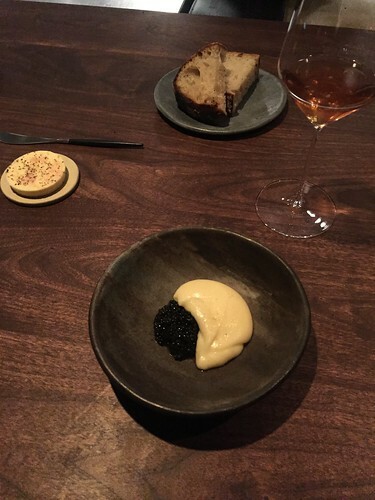 Caviar with potatoes that would make Joel de Robuchon cry they’re so buttery and addictive and hidden fermented radish on the bottom to cut through all that richness, served with sourdough bread and cultured butter and Tarlant champagne. Just look at those velvety potatoes and the way they’re draped in the bowl. Ugh. 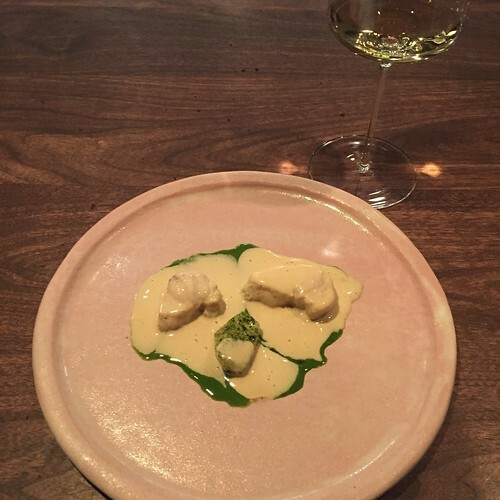 Monkfish with a sauce of its liver and a sauce of poblano. 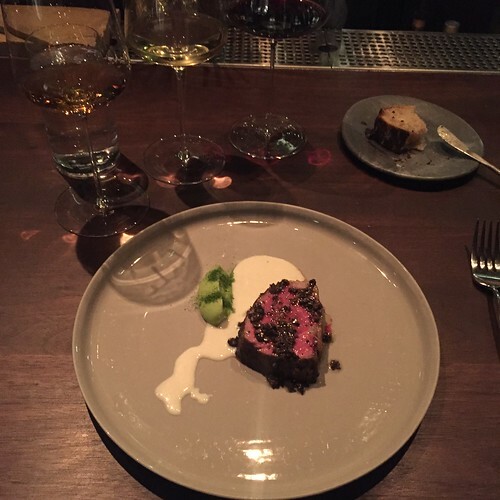 Love the heavily white presentation accented by the green (also I need to figure out where the dishware came from). 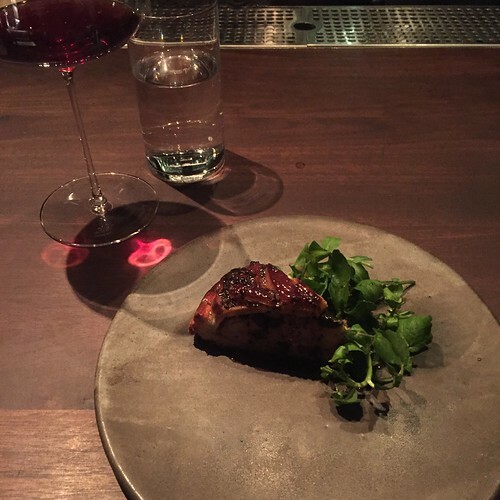 I was never really interested in monkfish prior but damn if this didn’t change my mind. So tender and ingenious to serve it with its own liver. Now I try to see if anywhere else has a better version. So far…no. Crack pasta. Actually, pyramidi with broccoli and aged cheddar with just a little black truffle shaved on top. Who knew broccoli pasta could be so exciting? If they figured out a way to freeze and package this, I’d eat nothing else, carbs be damned. Paired with Andre et Mireille Tissot Cremant du Jura “Indigene” NV rinsed with Tissot “Chateau-Chalon,” Vin Jaune, both from Jura, France. 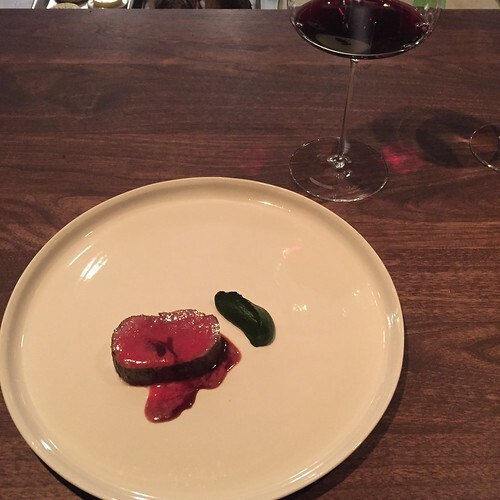 Venison with kale and olive berry, paired with 2011 Chateau Moulin de Tricot from Margaux, Bordeaux. 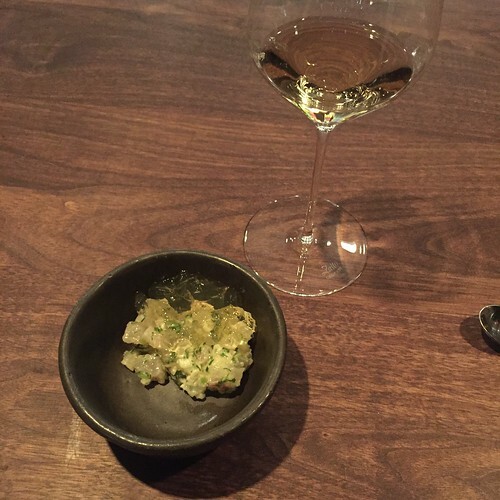 Another Ko favorite: foie gras with lychee, pine nut brittle and riesling jelly. Don’t really have anything to say about this other than it’s always wonderful. 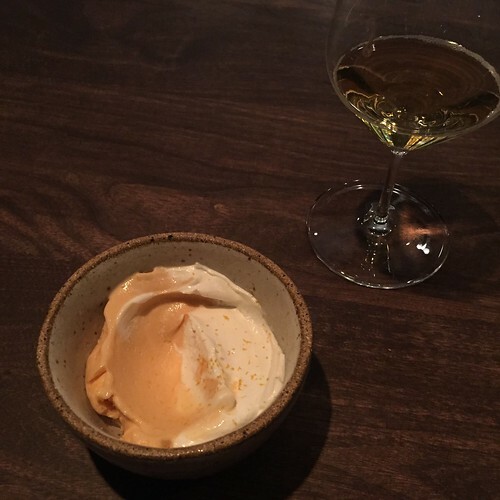 Ko’s version of a creamsicle – carrot cardamom and meringue, paired with a 2013 pear cider from Cidrerie de Vulcain from Switzerland. 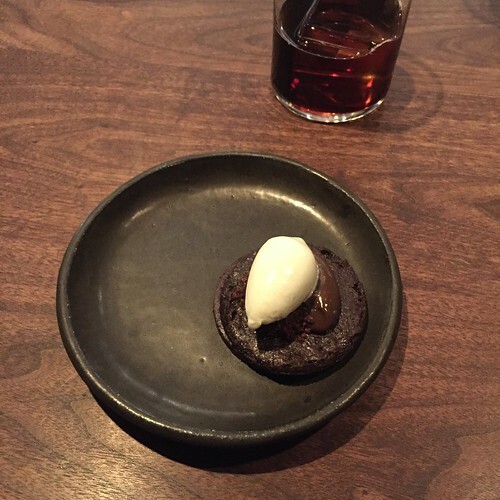 Chocolate cake with mint and fernet branca, paired with Zucca and root beer (?). Not typically one for desserts but the above creamsicle and this were just sweet enough without being cloying. Also, any dessert with fernet is OK by me. 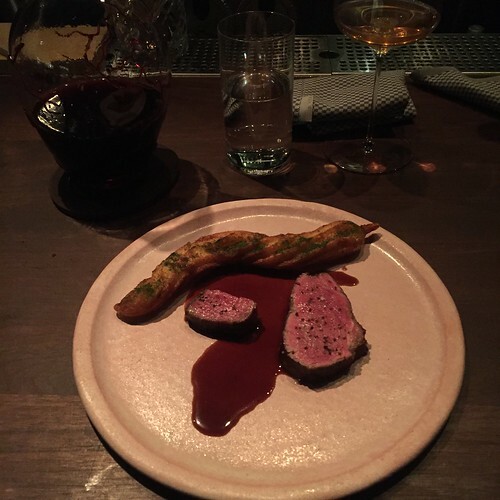 Happy Valley beef with accoutrements I can’t recall that was perfectly cooked and beautiful to look at. I think the green is some kind of parsley puree. Ko also started my obsession with MUD Australia ceramics that has by now cost me a pretty penny. 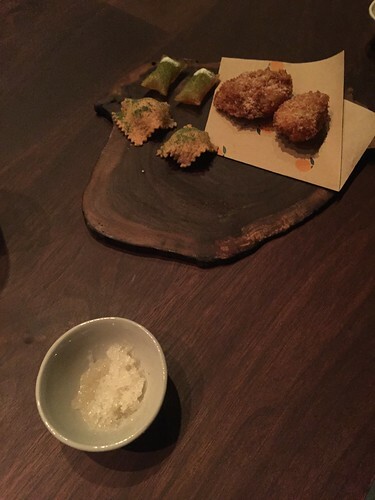 New amuse-bouches: fried chicken oysters with dried honey mustard (take that, Wendy’s! ), potato waffles, Ko Cheez-its and a shot of kimchi granita to offset all that fried goodness. On a following visit, we ordered another 6 pieces because we are crazy and the people there are awesome. 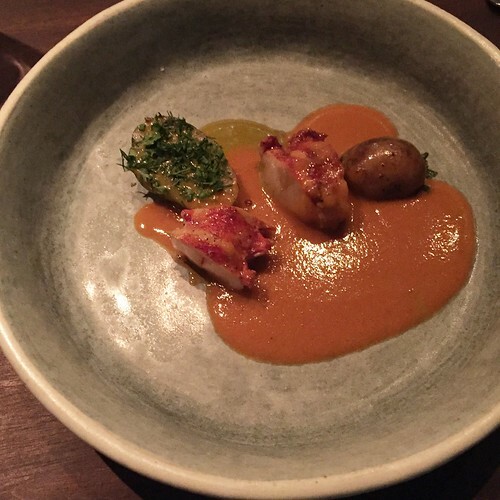 Lobster “bouillabaisse” with new potatoes and aioli. Just look at those colors. That sauce is one of the most shellfish-y (in a good way) sauces I’ve ever had and each time, I use their new flatbread to mop it all up. Duck pie and greens. Can’t imagine the technique and time that goes into making this dish come out as great as it did but it was gone within 30 seconds. 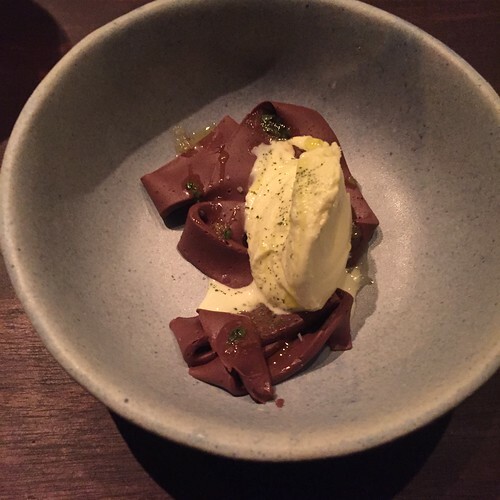 An early version of the chocolate mousse and olive oil ice cream dish that’s now on the counter menu. Again, slightly bitter and barely sweet, with a nice contrast from the bergamot sauce drizzled on top. Happy Valley beef again with a fried potato churro. That’s right. Potato. Churro. Think on this visit we had way too much wine (including a 1997 Soldera Brunello di Montalcino…life was not bad that day) so when I was hungover the next morning, 50 more of those churros delivered to my bed would’ve been really nice. 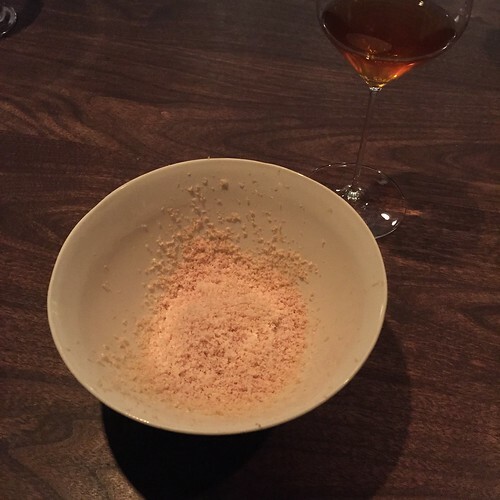 So if those above photos don’t make you go straight to the Momofuku Ko website and try to make a reservation (by the way, they’re actually open for lunch now as well), then I don’t know what will…Just do it and I can guarantee you’ll have a meal of a lifetime.